Students will be able to describe the different parts of a tree. Tell your students that they will be learning about the parts of a tree today. Ask your students if they know about any parts of a tree. 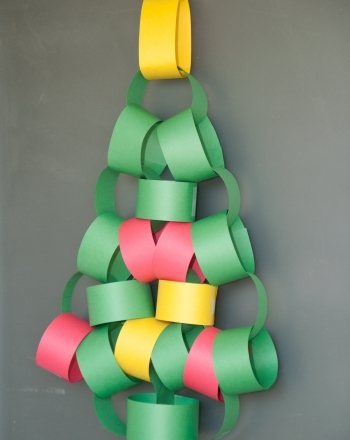 Place a fake tree in the classroom. Touch and show your students the leaves, trunk, roots, crown, branches, and twigs. Label each part using a sticky note. 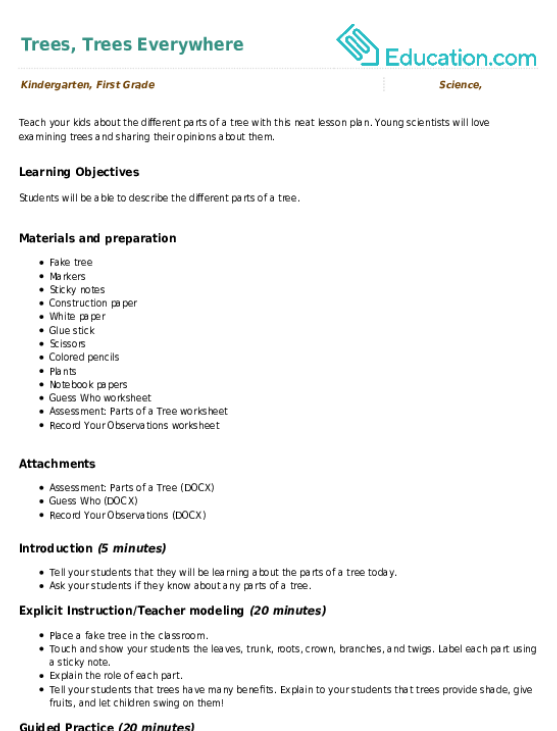 Explain the role of each part. Tell your students that trees have many benefits. Explain to your students that trees provide shade, give fruits, and let children swing on them! Ask your students to get into groups of three. Ask each group to draw, colour, and cut pictures of fruits and children swinging. Ask them to also draw, colour, and cut pictures of people and animals resting. After that, have your students pick their best pictures and stick them on the fake tree in the classroom. 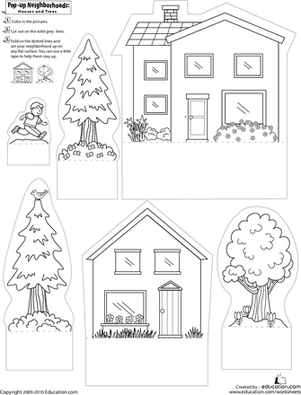 Ask your students to complete the Guess Who worksheet for parts of the tree. Enrichment:Ask advanced students to each get two plants. Tell your students to place one in their room and the other outside. Tell them to give water to the one outside. Ask your students to do this for ten days. Ask your students to record their observation each day using the Record Your Observation worksheet. Ask your students to answer the questions on the worksheet on the tenth day. Support:Have struggling students observe the fake tree in the classroom. Take hem outside, and tell them to touch and name the various parts of the tree outside. Ask them to also point or touch where fruits could grow, where people could rest, and where kids could swing on the tree. 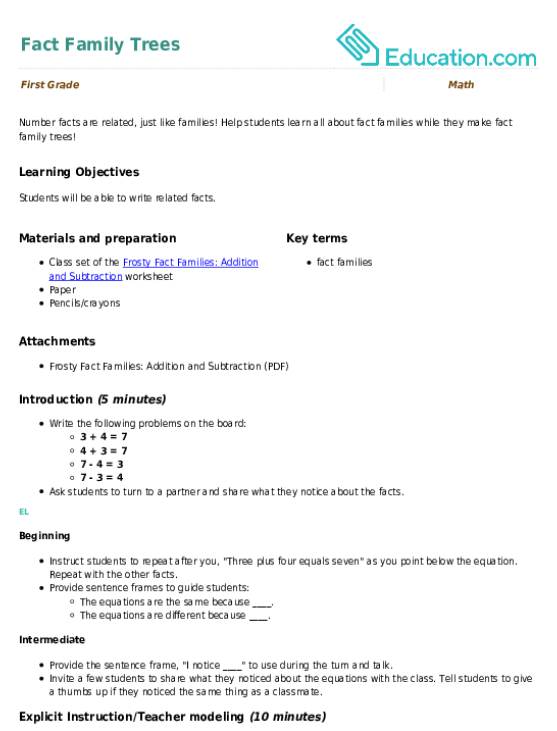 Ask your students to complete the Assessment: Part Of A Tree worksheet. Remind your students that trees are important, so they need to take care of them. Go around the class and ask each student to say one thing they can do to take care of trees. 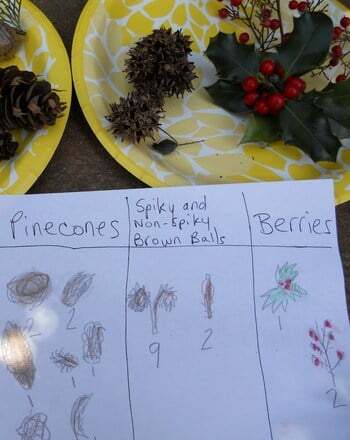 Young scientists will love examining trees and sharing their opinions about them. Hey treehuggers, how many trees can you count? Get your kindergartener ready for elementary school maths with this introduction to subtraction worksheet. 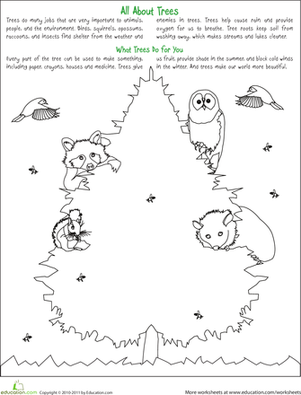 Kids will hone fine motor and handwriting skills as they learn how to draw trees. In this maths coloring sheet, your child can practise his simple addition and subtraction maths facts, and colour in the apple trees when he's finished. Let's talk about trees! Help your child use Earth Day as an excuse to praise the woody perennials that hardly ever get the recognition they deserve.